Tube-Tech PE 1C, Software parametric EQ from Softube in the Tube-Tech series. 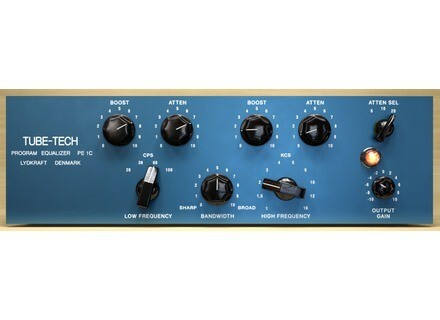 The Tube-Tech PE 1C is the Pultec style equalizer, a passive, tube-based equalizer designed to be suitable for different sources ranging from bass drums and guitars to vocals. The equalizer features a Low Frequency section made up of two low shelf filters which can be combined to attenuate and boost at the same time. The High Frequency section has a peak and shelving filter working in parallel, which is designed to provide a smooth top end while not getting too bright. The ability to combine the different filters and sections is what gives the PE 1C its characteristic sound, this is something which plays a crucial part in explaining the magic Pultec sound realized by this Tube-Tech classic. The Tube-Tech PE 1C plug-in by Softube captures the nuances of the hardware version. It has an analog sound that is evident as soon as you start using it. Tube-Tech PE 1C is available today at the Softube web shop and at authorized Softube dealers at an introductory price of $229 (Native) or $329 (TDM/Native), excl. VAT. The introductory offer will last until August 16 and thereafter the price will be $279 and $449, respectively. A fully functional 20 day demo can be downloaded from www.softube.com. Applied Acoustics Systems Updates Tassman 4 Applied Acoustics Systems released the Tassman 4 v4.1.6 update for Windows. Tekky Synths AcIdIc Tekky Synths has announced the release of AcIdIc, a subtractive synth for recreating the 303-style acid lines commonly heard in Acid House and Psytrance. Lick Library Jam With Jimmy Hendrix Vol. 2 Jam with Jimi Hendrix Volume 2 is a double DVD set with two hours of lessons to help you learn each song the way it was originally played.